A map of recent Hawaiian volcanism, highlighting the Loa and Kea tracks. Credit: Tim Jones, ANU. A study led by The Australian National University (ANU) has solved the 168-year-old mystery of how the world's biggest and most active volcanoes formed in Hawaii. The study found that the volcanoes formed along twin tracks due to a shift in the Pacific Plate's direction three million years ago. Lead researcher Tim Jones from ANU said scientists had known of the existence of the twin volcanic tracks since 1849, but the cause of them had remained a mystery until now. "The discovery helps to better reconstruct Earth's history and understand part of the world that has captivated people's imagination," said Mr Jones, a PhD student from the ANU Research School of Earth Sciences (RSES). "The analysis we did on past Pacific Plate motions is the first to reveal that there was a substantial change in motion 3 million years ago. It helps to explain the origin of Hawaii, Earth's biggest volcanic hotspot and one of the most popular tourist destinations in the world." Twin volcanic tracks exist in other parts of the Pacific, including Samoa, and the study found that these also emerged three million years ago. Mr Jones said this kind of volcanic activity was surprising because it occurred away from tectonic plate boundaries, where most volcanoes are found. "Heat from the Earth's core causes hot columns of rock, called mantle plumes, to rise under tectonic plates and produce volcanic activity on the surface," he said. "Mantle plumes have played a role in mass extinctions, the creation of diamonds and the breaking up of continents." Co-researcher Dr Rhodri Davies from RSES said the twin volcanic tracks emerged because the mantle plume was out of alignment with the direction of the plate motion. "Our hypothesis predicts that the plate and the plume will realign again at some stage in the future, and the two tracks will merge to form a single track once again," Dr Davies said. "Plate shifts have been occurring constantly, but irregularly, throughout Earth's history. 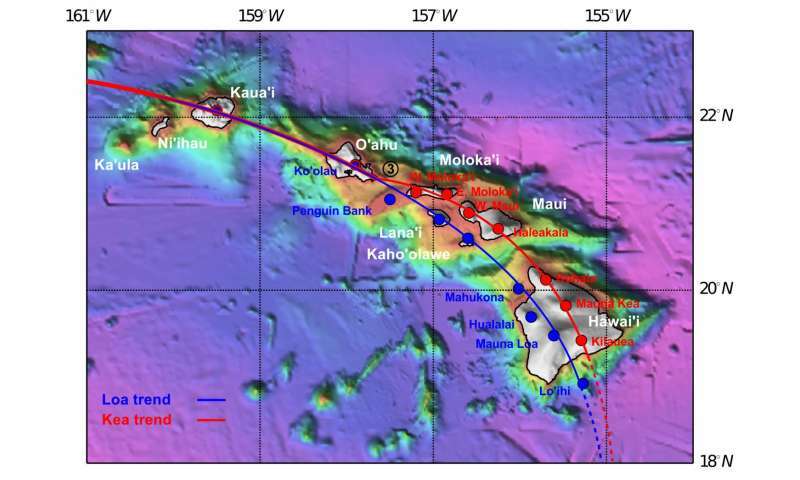 Looking further back in time we find that double tracks are not unique to young Hawaiian volcanism - indeed, they coincide with other past changes in plate motion." Hawaii sits at the south-eastern limit of a chain of volcanoes and submerged seamounts which get progressively older towards the north west. 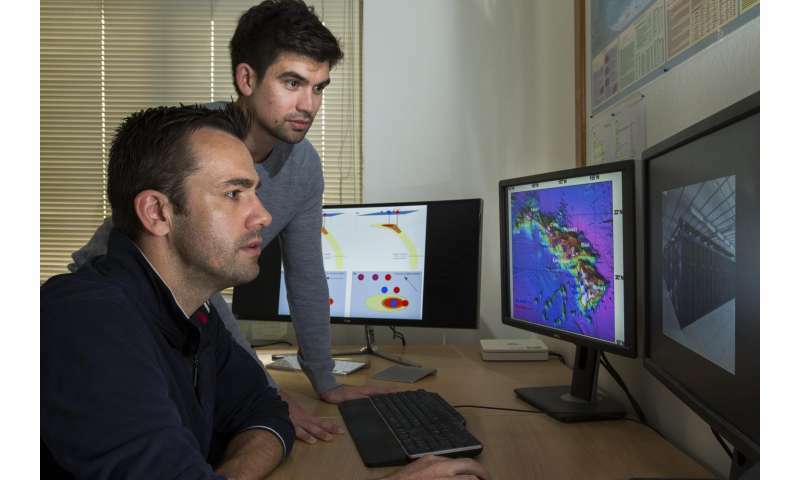 The researchers worked with the National Computational Infrastructure at ANU to model the Pacific Plate's change in direction and formation of the twin volcanic tracks through Hawaii. The study is published in Nature. Not sure what this article is saying. GREENLAND WAS ICED 3 MY AGO. So what happened to create this misalignment. There are actually no plates so did the globe stop in its rotation? And Thank Goodness start again? There are actually no plates so did the globe stop in its rotation?